Confession: I have had an Apple Watch since July and haven’t really USED it. But after asking all of you how you use your Apple Watch and your best Apple Watch tips for busy moms, I’m committing to wearing and using this magical little wrist computer! I felt like I needed to actually TRY all these things before I published them into a post but also didn’t want to keep you waiting any longer than you already have. So I’m committing to trying all these features over the next 2 weeks and I’ll update here :). You can answer calls and texts without having to have your phone right next to you. Which is great for being more present (around the kids, at bedtime, at dinner, etc) and being accessible during meetings or workouts without hauling your phone around. You can answer calls and texts while your kid has your actual phone – I try to avoid giving my children my phone, but sometimes a mom’s gotta do what a mom’s gotta do! The Apple Watch makes it possible to answer a call or text no matter what app your phone is in (looking at you, YouTube kids). Speaking of YouTube kids… you can ‘next’ a YouTube video your kid is watching on your phone – love the monitoring feature! It’s the ultimate timer – for making dinner or kids’ timeouts or anything in between. As an activity monitor – SO MANY OF YOU make it your goal to close the rings every day! there are 3 rings that track movement, exercise time, and standing. 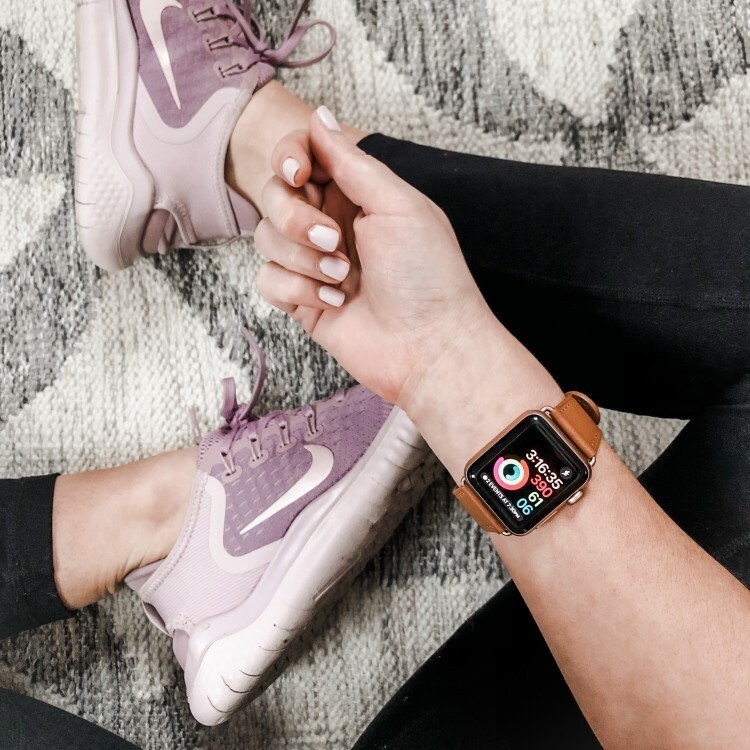 To track heart rate – this goes along with using the Apple Watch as a fitness tracker, but it can also track your heart rate. Also – super tech-y and medical – it can detect an irregular heartbeat and sends a notification. To find your phone – this is HUGE as a mom who loses her phone like 363573xs/day. You can ping your phone from your watch – #winning! As a navigation assistant – for times when you’re using maps on your phone but don’t want to stare at the screen while driving, the Apple Watch gives you a little ‘warning vibration’ before your next turn. To control music – you can flip through music that’s streaming through your phone from your wrist. Camera shutter button – I LOVE this feature, especially if you need to snap a pic with you in it while no one else is around. Use it to pay… you can pay for Starbucks with your phone. What a time to be alive! Talk to text for quick replies – this is something I love to do on my phone, again, so nice to not always have to have a phone on-hand. As a calendar alert – your ‘next up’ will show so you never miss anything on your calendar! Honestly, it seems like the most important feature for me is the ability to put my phone down in another room and BE PRESENT with my kids/husband/dog/whoever without the distraction and ‘comfort’ of a smartphone. I want to be connected, but I don’t necessarily NEED Instagram popping up every time I unlock my phone. Embarrassingly, I (often) unlock my phone to set myself a reminder or make a call, only to find myself buried in email or Facebook or Instagram, totally forgetting WHY I even opened my phone! So I’m looking forward to more of that freedom :).